1. Go to Domains, click the Domain Name. 3. Now in the record type column, locate MX record, and click the respective link in the Host column on the left. 4. Next, in the enter mail exchanger box, type the external mail server’s name and click OK.
5. Click Up Level to return to the Domain Management screen. 6. Now click Mail Accounts and Mail Settings. 7. Clear the Activate mail service on domain check box and click OK. Your domain will now use an external mail server. 2. Then, backup the hosts file. 3. Open hosts file there from the notepad. 4. At the end of the line you can see as per below. 127.0.0.1 BlockSitename.com # replace the BlockSitename.com with the site name that you want to block. European Windows Hosting :: DNS Tools - How to Use Traceroute? IP Whois – Also pronounced as Who is, this tool is more often used to know information about the IP address of a particular domain, its location and the details about the registrar and owner. It basically is a query and response protocol used extensively to lookup to databases holding information about registered users of an Internet resource. Reverse DNS lookup – Also referred to as the rDNS, it is mandatory to have it on your server. It is used for determining the association of a domain name with a particular IP address using the Domain Name System (DNS) of the Internet. SPAM DB Lookup – This tool enables server administrators to look for the possible accounts on server to be included in the spammers list. Spam DB lookup enables them to check if the server and its IP’s have been added to the list due to a possible spamming activity carried out by someone using the server. DNS Lookup – DNS lookup is used to determine various DNS records such as A, MX records, CNAME etc. for a particular domain. Using this simple tool, one can check where a particular site is hosted. There are many ways to connect by FTP to a host, we can use tools such as Filezilla, CoreFTP, or SmartFTP. 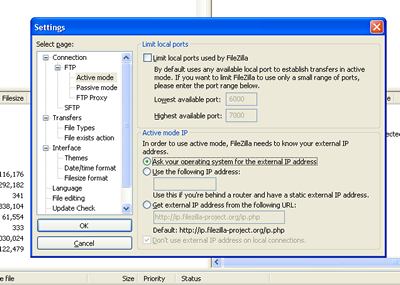 But I would recommend to use Filezilla, very simpe, FREE, and easy to use. In this article, I will assume you cant connect or you don’t have a FTP client software. So, in this case you need to use Internet Explorer to connect it. You can upload and delete files at your online server using Internet Explorer. This address is URL-encoded and comes from FtpUserID@YourDomainName.com where @ has been substituted with %40, which is the ASCII code for @. After visiting your website by using the above exampled address, Internet Explorer will open the site content in its window. Then from the “View” menu of Internet Explorer, you may select “Open FTP site in Windows Explorer” to edit, upload or delete the files at your web server.